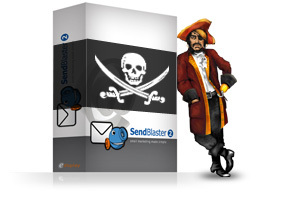 Are you looking for a cracked version of SendBlaster? Would you like to download a serial or a keygen (key generator) to use SendBlaster for free? Surfing on dangerous sites (in search of cracks and serials) and downloading executables (.exe) or archives often leads to virus, trojan and malware infections. This involves great risks to the integrity and security of your computer. In fact, a malware could easily intercept all your online banking accesses, important emails, password archives or other documents on your hard disk. And a virus could irreparably compromise the integrity of the operating system and erase all the data there stored, without any chance to recover them. Some illegal versions of SendBlaster created by hackers could allow them to take possession of your own address lists. This could nullify all the work done to create a legitimate database, as your contacts would be used by the creator of the crack for illegal purposes. Software updates are important to safety; using an illegal version of SendBlaster means that you cannot update the software systematically (as illegal codes and cracks only work on a single release) and thus potentially expose your computer and your data to major security risks. Using illegal software is a crime, but exposing other people’s private data to security risks because of negligence is a much more serious crime. Remember that with SendBlaster you are managing important third party’s data: so using a pirated version is an irresponsible behavior toward them (who can also take legal proceedings against you). Our software is equipped with an anti-piracy mechanism that allow us to monitor the use of pirated versions instead of disabling them immediately. Some invald serial keys or some keygens trigger a protection so that the software can apparently continue to operate for a limited period of time, but the illegal activity is intercepted and its origin recorded. The purchase of SendBlaster includes our technical assistance: buying the software also means that you’ll always have a team at your disposal to quickly resolve any issues. You might not evere need it, but if something goes wrong you know you can now count on an effective solution. SendBlaster is both powerful and cheap, and you pay for it only once. So, is it really worth to run even one of these risks in comparison with such a reasonable price? If you have already made the mistake of installing a pirated version and you want to put right before it’s too late, you just have to buy a legal license: upon request we can provide appropriate tools and guidance to ensure the integrity and security of your data.